TLJ News: January 16-20, 2012. 1/20. Sen. Harry Reid (D-NV), the Senate Majority Leader, announced in a release that "In light of recent events, I have decided to postpone Tuesday’s vote on the PROTECT I.P. Act". In addition, Rep. Lamar Smith (R-TX), sponsor of the Stop Online Piracy Act (SOPA) in the House, announced that the House Judiciary Committee (HJC) "will postpone consideration of the legislation until there is wider agreement on a solution". Previously, he stated that the HJC would delay until February. Back in December of 2011, Sen. Reid announced that on January 23 the Senate would begin consideration of S 968 [LOC | WW], the "Preventing Real Online Threats to Economic Creativity and Theft of Intellectual Property Act of 2011", "PROTECT IP Act", or "PIPA". Sen. Reid's announcement, along with Rep. Smith's announcements, constitute a major victory for Google and the other technology companies that oppose these rogue web sites bills, and a significant defeat for the content companies that support these bills. Sen. Patrick Leahy (D-VT), sponsor of the Senate bill, and Chairman of the Senate Judiciary Committee (SJC), responded that the Senate's failure to take up this bill is "knee-jerk reaction". Content industry groups expressed their disappointment. Groups that advocate the interests of Google and other tech sector companies praised the postponements. 1/20. Groups that articulate the interests of the technology and content companies reacted to the announcements by Congressional leaders that further consideration of rogue web sites bills will be delayed. Reaction from Opponents of SOPA and PROTECT IP Act. Ed Black, head of the Computer and Communications Industry Association (CCIA), stated in a release that "Those who value and appreciate the Internet can breathe a little easier today." He added that the internet needs to be protected "from those who would undermine its fundamental principles for parochial purposes". The Public Knowledge (PK) stated in a release that "Momentum is on our side, but proponents of PIPA and SOPA are going to double down in an effort to push legislation through". It added that the internet must be protected from "the kinds of policies that cripple critical networks merely because a few companies have not figured out how to adapt to them". Gary Shapiro, head of the Consumer Electronics Association (CEA), stated in a release that innovation "must not be blocked by one industry seeking to protect itself at the expense of another". He also said that Rep. Issa's OPEN Act "can and should be passed immediately". Leslie Harris, head of the Center for Democracy and Technology (CDT), stated in a release that "Senator Reid made the right decision in postponing next week's vote on PIPA. It's time for a hard reset on this issue. We need a thoughtful and substantive process that includes all Internet stakeholders. We need to take a hard look at the facts and find solutions that honor the Internet's openness and its unique capacity for innovation and free expression. We are thankful for the efforts of Senator Ron Wyden who from the beginning stood against this bill; his early opposition and leadership gave voice to the important concerns of the Internet community." Craig Aaron of the Free Press stated in a release that "While the PROTECT IP Act and its House counterpart, the Stop Online Piracy Act, are still kicking around the corridors of Capitol Hill, our elected members of Congress would be wise to relegate these bad bills to the dustbin of history." Reaction from Supporters of SOPA and PROTECT IP Act. Former Sen. Chris Dodd (D-CT), now head of the Motion Picture Association of America (MPAA), stated in a release that "As a consequence of failing to act, there will continue to be a safe haven for foreign thieves; American jobs will continue to be lost; and consumers will continue to be exposed to fraudulent and dangerous products peddled by foreign criminals". Cary Sherman, head of the Recording Industry Association of America (RIAA), stated in a release that "The Senate had an opportunity to have a national conversation about an important and urgent issue: protecting American workers and consumers from foreign criminals. It is a shame that the Senate will not have that debate next week." Sherman added that "This issue is too important, too vital to our economy, to let misleading demagoguery have a veto over meaningful reforms." Sandra Aistars, head of the Copyright Alliance, stated in a release that "We will to continue to engage and we look forward to working with all constructive voices to find a meaningful legislative solution, with the understanding that any such solution must include meaningful remedies for independent artists and creators to effectively combat the mounting problem of rogue websites." 1/20. Rep. Lamar Smith (R-TX) commented on HR 3782 [LOC | WW], the "Online Protection & Enforcement of Digital Trade Act", or "OPEN Act", introduced by Rep. Darrell Issa (R-CA) on January 18, 2012, as an alternative to the rogue web sites bill sponsored by Rep. Smith. See, story titled "Rep. Issa Introduces Alternative to SOPA" in TLJ Daily E-Mail Alert No. 2,331, January 18, 2012. Rep. Smith is the sponsor of HR 3261 [LOC | WW], the "Stop Online Piracy Act" or "SOPA". Rep. Smith stated in a release that "The OPEN Act makes the ITC a substitute for U.S. courts which have handled intellectual property cases since the founding of our country. Forcing individuals to come to Washington and hire expensive, specialized ITC lawyers, and argue their case before the ITC, means that only wealthy corporations will have the means to argue their claims. Under the Stop Online Piracy Act small businesses, entrepreneurs and innovators will be able to protect their property and Constitutional rights by going to federal courts wherever they live." He said that Rep. Issa's bill "amounts to a safe harbor for foreign criminals who steal American technology, products and intellectual property", and that it "creates loopholes that make the Internet even more open to foreign thieves". Like many opponents of his bill, Rep. Smith is engaging in hyperbole to criticize this bill. He elaborated that OPEN Act "bill narrows the definition of an illegal infringing site to such an extreme that it will be virtually meaningless and nearly impossible to prove." HR 3782 provides that an "Internet site dedicated to infringing activity" is "is accessed through a nondomestic domain name" and "conducts business directed to residents of the United States". These two qualifications merely limit these ITC actions to foreign rogue web sites that ship, stream or send infringing items to the US. However, the definition next provides that the web site in question "has only limited purpose or use other than engaging in infringing activity and whose owner or operator primarily uses the site" to infringe or circumvent. This would like preclude bringing these ITC actions against those linking web sites which also link to much non-infringing content, and those storage locker services that contain both infringing and non-infringing content. Then, the definition provides the condition that the web site operator uses the web site primarily to infringe under 17 U.S.C. § 506, violate the anti-circumvention provisions of 17 U.S.C. § 1201, or use counterfeit marks in violation of 15 U.S.C. § 1116(d). That is, in the case of digital infringement, this definition would require proof of criminal infringement, which includes willfulness, and commercial advantage or private financial gain. This does raise the burden upon the claimant. Taken together, the components of this definition would place some bad actors beyond the reach of the ITC, and make it more difficult meet the evidentiary burden as to other rogues. However, Rep. Smith's use of the phrase "virtually meaningless" is an overstatement. Rep. Smith also asserted that "Under the OPEN Act, even sites like Pirate Bay that openly promote online piracy would only be held accountable if the owner or operator agrees to appear before the ITC and be bound by its judgment." He did not elaborate. However, the OPEN Act affords foreign web site operators the means to evade action by the USITC. For example, if the web site operator consents to the jurisdiction of the U.S. courts, and accepts service of process, then claimants have no action before the USITC. However, a foreign web site operator might then ignore the judgment of the U.S. court, and continue with its infringing activity. While this bill provides that a USITC order could compel financial transaction providers and internet advertising services to cease providing financial and advertising services to the foreign web site, nothing in this bill provides that the U.S. District Court may grant such relief. Rep. Smith also directed his ire at the company that has done the most to derail his rogue web sites bill, Google. He wrote that "Google paid $500 million to settle a criminal investigation for promoting foreign illegal online pharmacies, possibly endangering Americans' health. The OPEN Act excludes search engines like Google from responsibility when it comes to enforcement of IP rights, even when they knowingly profit by directing consumers to illegal websites." See, story titled "Google to Pay $500 Million for Allowing Its AdWords Program to be Used to Promote Illegal Online Drug Sales" in TLJ Daily E-Mail Alert No. 2,292, August 24, 2011. Under Rep. Smith's bill, but not under Rep. Issa's bill, a search engine could be compelled to not return hyperlinked search results for the foreign rogue web sites covered an order of the court or USITC. 1/20. The Government Accountability Office (GAO) released a report [65 pages in PDF] on federal STEM education programs. It is titled "Science, Technology, Engineering, and Mathematics Education: Strategic Planning Needed to Better Manage Overlapping Programs across Multiple Agencies". 1/19. The U.S. District Court (EDVa) unsealed an indictment that charges several individuals and businesses connected to the Megaupload web site with criminal copyright infringement, money laundering, and related crimes. The business styles itself as a storage locker, but is dedicated to commercially exploiting the uploading and downloading of copyrighted movies, music and other works without authorization. 1/19. The Federal Communications Commission (FCC) stated in a release that Paul de Sa, Chief of the FCC's Office of Strategic Planning and Policy Analysis, "will leave the Commission in February". 1/18. Rep. Danny Davis (D-IL) introduced HR 3788 [LOC | WW], the "E911 Surcharge Fairness Act of 2011", a bill that addresses how state and local governments impose fees, taxes or surcharges on prepaid wireless mobile service. This bill was referred to both the House Commerce Committee (HCC) and House Judiciary Committee (HJC). Rep. Davis (at right) is not a member of either committee. The bill has no original cosponsors. The bill lists three types of fees or taxes, the imposition of which would be "unfair and inequitable manner" within the meaning of this bill. First, "(A) the imposition against a prepaid mobile service provider or seller of any E911 fee that the prepaid mobile service provider cannot collect from its end-user customers who are the intended payors of the fees under its existing wireless business model". Second, "(B) the enforcement of an E911 fee against a prepaid mobile service provider in a manner that creates strict liability for the prepaid mobile service provider or seller for its inability to collect as prescribed in subparagraph (A)". Third, "(C) the imposition of a E911 fee in a manner that results in the E911 fee being subject to other State or local taxes when such other State or local taxes are not equally imposed on the E911 fees paid by postpaid mobile service customers". This bill would only limit "new" fees or taxes. Hence, it would grandfather existing fees or taxes that are unfair or inequitable. This bill would only apply to prepaid wireless mobile services. Moreover, this bill would do nothing about state and local governments that impose fees, taxes or surcharges, with the stated purpose of supporting 911 or E911 service, but then divert some or all funds so collected to subsidize other government programs. See, story titled "FCC Reports that States Divert 911/E911 Fees to Subsidize other Programs" in TLJ Daily E-Mail Alert No. 2,126, August 19, 2010. This bill recites in its findings that "Wireless E911 has been typically funded in the postpaid model by a uniform monthly surcharge on customer bills, but prepaid mobile services are purchased by customers at retail on a `pay-as-you-go´ basis, and there are no bills." It continues that states' methods of imposing taxes on prepaid mobile services "have ranged from imposing and collecting no surcharges from prepaid customers, to shifting the burden to pay the surcharge to providers and sellers of prepaid mobile services." It adds that "The latter solution has resulted in unfair and inequitable treatment of the prepaid mobile service business model and reduced funding for E911." The 110th Congress enacted HR 3403 [LOC | WW], the "NET 911 Improvement Act of 2008". It is now Public Law No. 110-283. The committee reports, but not the act, address imposition of E911 fees and taxes for prepaid mobile services. For example, House Report No. 110-442 states that the HCC "also encourages States and their political subdivisions to apply 911 fees equitably to providers of different types of communications services to the extent possible. In particular, the Committee urges States and their political subdivisions, when adopting 911 and E-911 fees, to examine fee structures that accommodate pre-paid telecommunications services." 1/18. Rep. Darrell Issa (R-CA) introduced HR 3782 [LOC | WW], the "Online Protection & Enforcement of Digital Trade Act", or "OPEN Act", as an alternative to the SOPA. Rep. Issa released a draft [18 pages in PDF] of this bill last month, just before the House Judiciary Committee (HJC) began its mark up of HR 3261 [LOC | WW], the "Stop Online Piracy Act" or "SOPA". See, story titled "Rep. Issa and Others Propose USITC Based Approach to Web Sites Dedicated to Infringing Activity" in TLJ Daily E-Mail Alert No. 2,318, December 14, 2011. The OPEN Act affects trade and intellectual property law. It was referred to the House Ways and Means Committee (HWMC) and HJC. It would amend the USITC's Section 337 authority, by adding a new subsection titled "Unfair Trade Practices Relating to Infringement of Copyrights and Trademarks by Certain Internet Sites". It would provide that once the USITC has issued a cease and desist order under this new subsection, "a financial transaction provider shall expeditiously take reasonable measures designed to prevent or prohibit the completion of payment transactions by the provider that involve customers located in the United States and the Internet site subject to the order". Similarly, "an Internet advertising service shall expeditiously take technically feasible measures intended to cease serving advertisements to the Internet site subject to the order ... in situations in which the service would directly share revenues generated by the advertisements with the operator of the Internet site". Rep. Issa and others issue a joint release that states that the OPEN Act "delivers stronger intellectual property rights for American artists and innovators while protecting the open, accessible Internet Americans deserve." The list of original cosponsors includes several other members of the HJC: Rep. Jason Chaffetz (R-UT), Rep. Jared Polis (D-CO), Rep. Dennis Ross (R-FL), Rep. Jim Sensenbrenner (R-WI), and Rep. Zoe Lofgren (D-CA). Rep. Polis demonstrated during debates in the first phase of the HJC's mark up of the SOPA that he has a deeper understanding than most of his colleagues of the contents of the SOPA, and the technologies and business practices that would be affected by the SOPA. He stated in the joint release that "Unlike SOPA and PIPA, the OPEN Act will effectively combat piracy from foreign websites while preserving Internet freedom. By using a 'follow-the-money' approach we can shut down foreign sites that steal intellectual property while ensuring that the Internet remains an engine of innovation, information and job creation. Without access to capital, these foreign websites will wither and die while the Internet continues to grow and thrive." Rep. Chaffetz stated in this joint release that "SOPA threatens our cyber security, undermines freedom of speech, and chills innovation in one of the few sectors of our economy that is actually working. While I understand and appreciate the need to protect intellectual property, SOPA is a massive and inappropriate overreach. Instead, I strongly support the OPEN Act. This bi-partisan legislation addresses the problem of online piracy without causing collateral damage to the Internet as SOPA would." 1/18. HR 3261 [LOC | WW], the "Stop Online Piracy Act" or "SOPA", and HR 3782 [LOC | WW], the "Online Protection & Enforcement of Digital Trade Act", are both directed at reducing the harms caused for foreign web sites dedicated to infringing intellectual property rights. These are broad bills with many provisions. However, the key component of the SOPA is a Department of Justice (DOJ) brought in the U.S. District Court. The key component of the OPEN Act is a rights holder action before the U.S. International Trade Commission. The SOPA's main process is to allow content companies to approach ex parte the DOJ with their grievances against foreign infringing web sites. The DOJ in its discretion could then bring an action in any U.S. District Court against a foreign web site owner or operator (an in personam action against persons or entities unlikely to receive actual service of process) and the web site and domain name (nominally an in rem cause of action). The role of Court would be minimal. Its main function would be to issue an immediate ex parte cease and desist order, and authorize service of that order upon U.S. internet service providers, internet search engines, payment network providers, and internet advertising services. These entities would then be required by the SOPA to take certain actions. For example, an ISP would be required to prevent access by its subscribers located in the U.S. to the foreign infringing site that is subject to the order. Similarly, a search engine must prevent the serving, in response to a query, of a direct hypertext link to the foreign infringing site that is subject to the order. Also, under SOPA a payment network provider would be required to prevent its service from completing payment transactions involving its customers located in, and who have accounts in, the U.S., and the payment accounts of an foreign infringing site that is subject to the order. In contrast, under the OPEN Act, content companies would petition, in an open proceeding, the USITC to launch an investigation into, among other things, the imports of infringing digital products into the U.S.
Then, the USITC would be authorized to initiate an investigation, and issue a cease and desist order against foreign web sites that provide illegal digital imports. A USITC order would compel financial transaction providers and internet advertising services to cease providing financial and advertising services to the foreign web site. A USITC order, under this bill, would not, however, compel action by search engines to not return hyperlinked search results for web sites covered by the order; nor would it compel internet access service providers to block access to domain names covered by the order. 1/18. Rep. Lamar Smith (R-TX) responded to recent criticism of HR 3261 [LOC | WW], the "Stop Online Piracy Act" or "SOPA". He stated in a release that "I realize some people are nervous because of misinformation about this bill, but I am confident that ultimately the facts will overcome fears. We will continue to work with members, outside organizations and stakeholders to reach consensus and produce strong legislation that protects both intellectual property and technology." "Contrary to critics' claims, SOPA does not censor the Internet. It only targets activity that is already illegal, and only targets foreign websites that steal and sell America’s technology, inventions and products. And it is similar to laws that already govern websites based in the U.S."
He continued that "I am open to constructive suggestions that protect American inventors and intellectual property rights holders. Unfortunately, some critics simply want to maintain the status quo which harms U.S. companies, consumers and innovators. Illegal piracy and counterfeiting cost the U.S. economy $100 billion and thousands of jobs every year. Congress cannot stand by and do nothing while some of America’s most profitable and productive industries are under attack." He concluded that "We need strong and effective legislation to protect American technology and put foreign thieves out of business. I will continue to work to address legitimate concerns and encourage members and stakeholders to provide substantive recommendations for how best to address the problem of online theft." Sen. Charles Grassley (R-IA) stated in a release on January 18 that "It's critical we protect the intellectual property rights of our businesses and fight online infringement, but at the same time, we can't do harm to the internet, the Constitution, or the ability of businesses to grow and innovate. Internet piracy is illegal, and we need to find a way that works for all sides. The current Protect IP Act needs more due diligence, analysis, and substantial changes. As it stands right now, I can't support the bill moving forward next week." 1/17. Rep. Lamar Smith (R-TX), the Chairman of the House Judiciary Committee (HJC), announced in a statement that the HJC will resume its mark up of HR 3261 [LOC | WW], the "Stop Online Piracy Act" or "SOPA", in February. Rep. Smith, the sponsor of the SOPA, wrote that "To enact legislation that protects consumers, businesses and jobs from foreign thieves who steal America's intellectual property, we will continue to bring together industry representatives and Members to find ways to combat online piracy." Rep. Smith (at left) added that "Due to the Republican and Democratic retreats taking place over the next two weeks, markup of the Stop Online Piracy Act is expected to resume in February." He concluded that "I am committed to continuing to work with my colleagues in the House and Senate to send a bipartisan bill to the White House that saves American jobs and protects intellectual property." The HJC conducted the first phase of its mark up of the SOPA on December 15 and 16, 2011. See, manager's amendment as amended by amendments approved on December 15 and 16. Opponents of the bill waged a successful mark up filibuster that including demanding a full reading of the 71 pages amendment in the nature of a substitute, demanding roll call votes on amendments when the outcome of votes was not in doubt, offering too many amendments to be considered in the allocated time, and engaging in redundant debate over these amendments. Opponents caused over twelve hours to be consumed before Rep. Smith relented. See, stories titled "House Judiciary Committee Begins Mark Up of SOPA" in TLJ Daily E-Mail Alert No. 2,319, December 15, 2011, and "House Judiciary Committee Continues Mark Up of SOPA" in TLJ Daily E-Mail Alert No. 2,320, December 20, 2011. Sherwin Siy of the Public Knowledge (PK) stated in a release that "We were disappointed to learn the Chairman Smith said he would resume Judiciary Committee consideration of the Stop Online Piracy Act (SOPA) in February. It would be better for the Committee to take some time and arrive at a consensus approach to resolving the issues in SOPA that have resulted in nation-wide protests, rather than to force through a bill on which there is widespread disagreement." 1/17. Rep. Bob Goodlatte (R-VA), a senior member of the House Judiciary Committee (HJC), and a cosponsor of the HR 3261 [LOC | WW], the "Stop Online Piracy Act" or "SOPA", was a luncheon speaker at the State of the Net conference in Washington DC on January 17. He said that any successful bill will require buy in from both the content and technology communities. Rep. Goodlatte (at right) stated that "I am convinced that the tech industry has additional contributions to make in the effort to create tools to better combat online theft, making sure that our First Amendment freedoms are protected, and the internet is not harmed." "In fact, in a joint letter to Congress recently many prominent internet companies signed on to this letter regarding SOPA, stating, quote, we support the bill's stated goals providing additional enforcement tools to combat foreign rogue web sites that are dedicated to copyright infringement and counterfeiting." "We should take a full opportunity to bring tech industry leaders and engineers together with those representing the myriad of businesses that are suffering substantial theft and fraud due to illegal actions of foreign criminals so that new ideas can be put on the table with careful examination about how the tech sector can work with affected partners to fight this scourge." Rep. Goodlatte continued that "The technology and content communities and others doing business on the internet need each other. The technology community needs creative new content to continue to push continued consumer demand for innovative tech products. The content community needs the innovative technology community to continue to find ways to deliver new content to consumers." "Any successful legislative product will have to have some level of buy in from both communities. We call all agree on the importance of protecting American innovation from foreign thieves. So I think it is critical that key parties have a seat at the table. And I will work to facilitate this kind of face to face discussion between the various interested parties." He also spoke with reporters afterwards. He stated that Rep. Lamar Smith (R-TX) "hasn't set a date yet for return to the mark up". He also said "there needs to be more face to face dialogue between parties that need each other." He declined to state who are the major players, how many people should be invited into the room, or who should be invited. "I want this dialogue to take place regardless of what happens with the legislative process", and it should continue afterwards, said Goodlatte. He did not address what should be the contents of the SOPA in either his luncheon speech, or in his discussion with reporters. 1/17. Sen. Patrick Leahy (D-VT), the Chairman of the Senate Judiciary Committee (SJC), wrote in a statement that, as first announced last month, the full Senate will begin consideration next week of S 968 [LOC | WW], the "Preventing Real Online Threats to Economic Creativity and Theft of Intellectual Property Act of 2011", "PROTECT IP Act", or "PIPA"
Sen. Leahy, the sponsor of the PROTECT IP Act, stated that "The Senate will debate this important bill, which has been pending on the Senate's calendar since May, next week." Sen. Leahy and others introduced S 968 on May 12, 2011. The SJC amended and approved it on May 26, 2011. 1/17. Some widely used web sites, whose operators oppose pending legislation pertaining to foreign rogue web sites, are engaging in theatrics on January 18 in an effort to attract public attention to, and generate grass roots opposition to, these bills. At issue are S 968 [LOC | WW], the "Preventing Real Online Threats to Economic Creativity and Theft of Intellectual Property Act of 2011", "PROTECT IP Act", or "PIPA", which the Senate is scheduled to take up next week, and HR 3261 [LOC | WW], the "Stop Online Piracy Act" or "SOPA", which the House Judiciary Committee (HJC) is scheduled to complete marking up next month. Google has temporarily placed a black box over its logo, and added the accusation to its main page, "Tell Congress. Please Don't Censor the Web!" Wikipedia temporarily made its web site unavailable. Reddit is scheduled to go offline for 12 hours on January 18. Sen. Patrick Leahy (D-VT), the Chairman of the Senate Judiciary Committee (SJC), and sponsor of the PROTECT IP Act, wrote in a statement that "Much of what has been claimed about the Senate's PROTECT IP Act is flatly wrong and seems intended more to stoke fear and concern than to shed light or foster workable solutions." Sen. Leahy explained that "The PROTECT IP Act will not affect Wikipedia, will not affect Reddit, and will not affect any website that has any legitimate use. A foreign rogue website is clearly defined as one that has no real purpose other than infringement. Theft and fraud on this scale undermines consumer trust in online transactions." "Perhaps if these companies would participate constructively, they could point to what in the actual legislation they contend threatens their websites, and then we could dispel their misunderstandings. That is what debate on legislation is intended to do, to fine-tune the bill to confront the problem of stealing while protecting against unintended consequences", said Sen. Leahy. 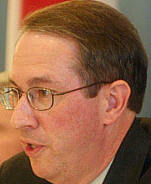 Rep. Bob Goodlatte (R-VA), a senior member of the HJC, and a cosponsor of the SOPA, spoke to reporters at the State of the Net conference in Washington DC on January 17. He stated that "what we need to have is a discourse". He added that "a blackout doesn't accomplish that." "I think that the more important thing here is that people actually talk to each other, rather than black out their patrons", said Rep. Goodlatte. "That does not promote a solution to this problem, and a discourse would. So, hope that those same people will think about stepping forward, and saying we would like to talk." Chris Dodd, head of the Motion Picture Association of America (MPAA), which supports the SOPA and PROTECT IP Act, stated in a release that "some technology business interests are resorting to stunts that punish their users or turn them into their corporate pawns, rather than coming to the table to find solutions to a problem that all now seem to agree is very real and damaging." Former Sen. Dodd (D-CT) added that "It is an irresponsible response and a disservice to people who rely on them for information and use their services. It is also an abuse of power given the freedoms these companies enjoy in the marketplace today. It’s a dangerous and troubling development when the platforms that serve as gateways to information intentionally skew the facts to incite their users in order to further their corporate interests." 1/17. The Department of Commerce's (DOC) Bureau of Industry and Security (BIS) published a notice in the Federal Register announcing that it seeks private sector members for its seven technical advisory committees (TACs), which advise the BIS on the control of exports of products, software, and technologies. There are BIS TACs for electronics, computers, telecommunications and information security, and other sectors. There is no deadline. See, Federal Register, Vol. 77, No. 10, Tuesday, January 17, 2012, at Page 2271. Go to News from January 11-15, 2012.